Wearable technology delivers visual data and instructions to workers in warehouses and on manufacturing sites. 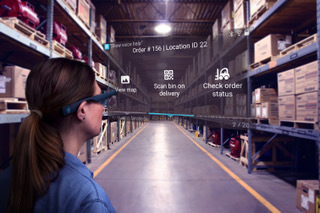 Upskill, a wearable technology provider funded by Boeing Co. and General Electric Co., has released a new version of its software for augmented reality (AR) devices that display visual information for warehouse or maintenance workers, the company said Tuesday. Vienna, Va.-based Upskill's latest Skylight software platform supports an improved user interface (UI) for easier adoption and improved scalability that allows users to deploy smart glasses across a global workforce, the company said. Employees who wear smart glasses powered by the software can see information such as inventory picking instructions or maintenance diagrams superimposed over the real-world view they can see through the glasses. The approach allows AR users to keep their hands free for material handling and helps warehouses to quickly train new workers to handle peak demand, according to the Upskill website. Chicago-based Boeing and Boston-based GE are among the customers using Upskill technology. Upskill has also won funding from New Enterprise Associates (NEA), a venture capital firm that has made major investments in supply chain technology startups, such as $50 million for prescriptive analytics vendor Aera Technology and $42 million for online truckload marketplace provider Transfix. Feedback: What did you think of this article? We'd like to hear from you. DC VELOCITY is committed to accuracy and clarity in the delivery of important and useful logistics and supply chain news and information. If you find anything in DC VELOCITY you feel is inaccurate or warrants further explanation, please ?Subject=Feedback - : Upskill releases new software for smart glasses">contact Chief Editor David Maloney. All comments are eligible for publication in the letters section of DC VELOCITY magazine. Please include you name and the name of the company or organization your work for.